As Director of Community at salesforce.com, I hear a lot of great stories from customers and fans. Here are four of these stories, including one from a Salesforce MVP (and one incorporating LEGO), that show how Salesforce can make a difference in the careers, lives and well-being of our world. From a professional sense, salesforce.com basically forged my career path for me. I was introduced to salesforce.com when I was a Marketing Administrator back in 2004. I became passionate about it almost immediately, and knew then that I would take on a career in Salesforce. Since then, I have managed a Salesforce environment for multiple companies in many industries, and those positions have allowed me to see the world. I'd never left the country, and now because I'm the CRM Program Manager at an organization with a global presence, I now travel to many countries implementing SFDC solutions. There are two things I'm passionate about in my work life: streamlining processes and getting a 360-degree view of my customers. 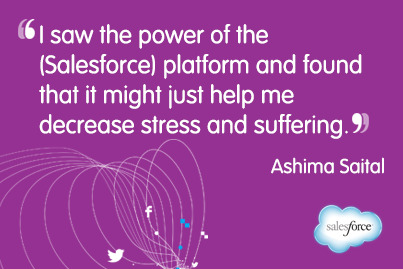 When I first found Salesforce, I was working on building my own version of a CRM in Access. At the time I was working as a call center manager and knew I needed a tool to track our progress. On a personal note, I enjoy making note that salesforce.com not only built my house, it turned it into a home. At the age of 24, because of the great demand for SFDC in Houston, and what I still consider a short supply of SFDC professionals here, I was able to build my first house. And as a result of meeting my husband while I was in San Francisco attending Dreamforce, that house is now a home! I have worked a long series of jobs, from retail to an Arabian horse farm. I’m a single parent, my mother and stepfather retired and then lost their house; so they moved in with me. I have been financially and emotionally struggling to make it through for what seems like a very long time. Then, in 2003, I was hired at MRC. I liked my job, but it was just that; a job. It was just lacking that special “something". In 2007, the leadership team at MRC made the decision to use salesforce.com instead of building our software from the ground up. That is when my life changed radically. I fell in love with the Force.com platform and took every opportunity I could find to learn something new about it. The Director of Operations at MRC discovered this, and put me on the team tasked with customizing the application. I attended Dreamforce for the first time in 2009. Last year, I was privileged to present a session with Mary Scotton, and help organize a Women in Technology panel that had over 600 women in attendance, and was even mentioned in Forbes.com by Marc Benioff! I am active in the community, help run the GirlyGeeks Dreamforce Group, and I donate time to a non-profit as their Salesforce Admin. I took the certification exam and was certified Dev401 at Dreamforce in 2011, and was inducted into the Winter ’13 MVP class. I’ve met other people as passionate about Salesforce as I am and am honored to be a part of this group. In the past four years, each year has provided more and more opportunities to learn and grow. Every day, I wake up realizing that without salesforce.com, and the salesforce.com community, I would still be working a “job”, and would not have this passionate and fulfilling career. I've been in technology for decades, focusing on database consultant and development work. While I love learning about various businesses and how they use data, I often saw how much disruption and stress databases could cause. This stress impacted me quite strongly. I worked for NPower Michigan and saw first hand the struggles these nonprofit organizations endured with tools like MS Access, Filemaker Pro, Excel, Word, etc. It broke my heart and I tried my best to provide them with what they needed. Most of my work was with small, financially strapped organizations who were doing truly amazing charitable work. Being raised with Eastern philosophies and wanting to cultivate awareness, mindfulness and compassion, and to lessen others' suffering, I found that my work was at odds with my lifestyle. This caused me much stress. So, clients were stressed because they couldn't get what they needed. I was stressed because I was at odds with myself. Then, while working at the Johnson Center for Philanthropy, I discovered salesforce.com. 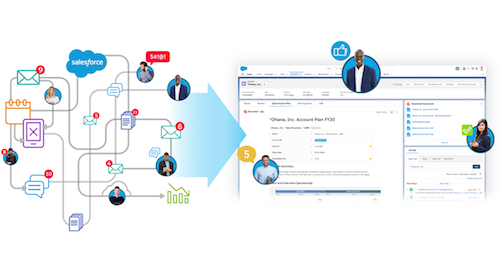 After implementing Salesforce for the JCP, I saw the power of the platform and found that it might just help me decrease stress and suffering for myself and the organization. So, I submitted a proposal to a local foundation, found three nonprofits who were willing to experiment with me, and found it was quite successful (four years later, they are still using Salesforce). This began my business of blending my Eastern philosophical upbringing with my database consulting. I've come to find that with this new way of working, both my clients and I have less stress, less suffering, and way more time to devote to compassion and world changing. I attribute this to two main factors: (1) a great tool came along that was easy enough for end users to grasp and use (clicks not code); and (2) my philosophical upbringing. 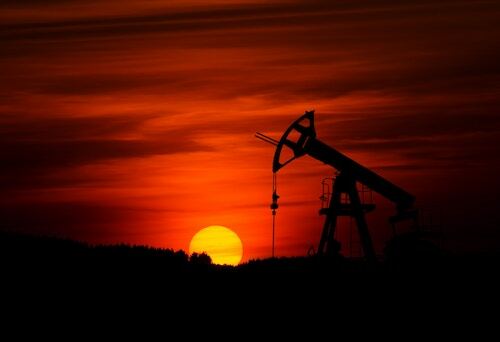 To be able to leverage technology to help improve the world is a wonderful thing. 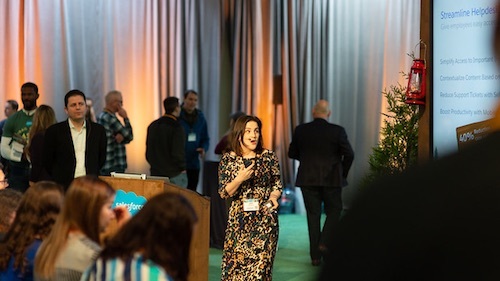 My story is more than the Salesforce product, and more than the community: it's really about the coming together of greatness that put me on a path I never would have imagined. Five years ago I left my middling job as a systems admin to go work for a consulting firm. I was hired to become a Business Analyst for web projects. The week before I was scheduled to start, my future bosses went to Dreamforce and came back with a vision to build a product on Salesforce. (That product is now on the AppExchange called NimbleAMS). They ceded the new "Salesforce Team" to myself and a few other folk to get it started. I immediately became immersed in the system. And yes, in 2008-2009 the product was still amazing. We did incredible things, and I learned a ton. The community, which was in its infancy, was just amazing. At Dreamforce 2009 I made many lifelong friends, notably Matt Brown, Jeff Grosse, and Mike Gerholdt. The whole "Salesforce thing" really started picking up steam and as my ties with the community improved, my job productivity improved with it, and our march toward producing a product gained momentum. In 2011 something magical happened. I got an email asking if Salesforce could film "the Lego thing" and use it for a promo at Dreamforce. That set off a chain of events that would change me forever. At Dreamforce that year, I felt like I knew everybody. Both from the video, and from increased participation in the community. The MVP program was born, and I started to see something beyond the product, beyond the community, I saw an economy that Salesforce had created. An environment that was begging to draw out the best in people, challenge us, and help us succeed. So, I made another change and helped found Red Argyle, a Salesforce consulting and ISV partner. Never in a million years up to that point did I have any real entrepreneurial spirit. Salesforce helped ignite that in me, encourage me, and between the staff and my community friends, I was convinced this would be amazing. Fast forward to today. We're now a rapidly growing company, working the way we want, with satisfied customers and great projects behind us. The product was the foundation. The staff at Salesforce was the fire that drove our success, and the community the love, energy, and encouragement that helped me become who I am today, still excited about where things will go. Krystal Carter is currently the salesforce.com Specialist at ION Geophysical, and has been a champion of the cloud since 2004. Experienced in CRM implementation in many industries, she also lends her experience by volunteering to help non-profits with their Salesforce implementations. Krystal has spent her spare time directing a teen acting company, traveling and hosting social gatherings. Shannon Dykes has worked for MRC for the past ten years. As the business grew, she transitioned to multiple positions, helping to create many of the processes still used today. In 2007, MRC built out a custom software solution on the Force.com platform. Six years later, she's been DEV401 certified and is active in the Salesforce.com community. Shannon blogs about her Force.com experiences, is a fourth-timer at Dreamforce this year, and helps manage the GirlyGeeks Dreamforce Chatter group. She was inducted as a Salesforce MVP in Winter '13. Ashima Saigal combined personal and professional experiences with her ongoing education and yoga practice, to form the foundation of Database Sherpa. Ashima is proactive and thought-provoking, encouraging dialogue whenever possible. She lives with her friend David, their daughter Zola, and crazy dachshund Chumba near Grand Rapids, MI. She loves to travel, meet new people, try new foods, and play board games. Garry Polmateer is currently Managing Partner of Salesforce Consulting firm Red Argyle, LLC where he helps companies implement Salesforce, build custom applications, and have an all around good time. He has been working in IT for over 15 years in administration, design, and consulting roles. Garry became Salesforce certified in 2009, has been a member of the community MVP program since 2010, and socializes through Twitter as @DarthGarry. To learn more about creating a community with Salesforce, click here. Be sure to make your own Dreamforce memories by registering for Dreamforce 2013, taking place on Nov 18-21, 2013 at the Moscone Convention Center. Register at the button below.